On 26 February, members of the International Committee for Future Accelerators (ICFA) gathered in a conference room in Tokyo, Japan, for the press conference. 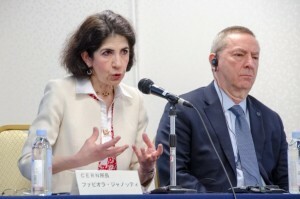 Joachim Mnich, Research Director at DESY and the current chair of ICFA, Nigel Lockyer, Director of Fermilab, U.S., Fabiola Gianotti, Director-General of CERN, and Masanori Yamauchi, Director-General of KEK sat at the conference, explaining the status of accelerator science in the world. Mnich introduced the mission of ICFA: it facilitates international collaboration in planning, construction and exploitation of accelerators for high-energy physics and related fields, and it has 40 years of history in international collaboration. He said that ICFA’s major topic over the last years was the ILC. ICFA has proposed and promoted the ILC as a global project, and repeatedly confirmed its support for the ILC, which is in a mature state of technical development. “ICFA decided yesterday on its continuous study and support, and set up the sub group toward the realisation of the ILC” he concluded his talk with the decision made by ICFA’s meeting. “You might think the Higgs boson is something far away from our everyday life, but actually it is not,” said Gianotti in her talk. “ This tiny particle is very, very special. Without the Higgs boson, our own existence is not possible,” she stressed the importance of further study of the Higgs boson. She said that many people often ask if the Higgs boson will change people’s lives, and her answer to that question is “it does already”. In order to find this particle, scientists have developed many cutting-edge technologies in many fields. She gave the example of the medical applications and also the world wide web, invented by the physicists to communicate with colleagues overseas, which has drastically changed the way we live. 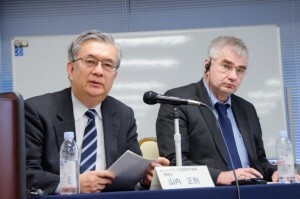 “The motivation for much of the research in particle physics is to go beyond the standard model,” Yamauchi said. “If we can go beyond the standard model, universal questions such as “what is dark matter?” or “why is there are no anti matter around us?” can be answered”. He said that world scientists are tackling this challenge by international collaboration and competition. “The ILC is one of the tools for next-generation research, and around the world scientists are hoping for its realisation. 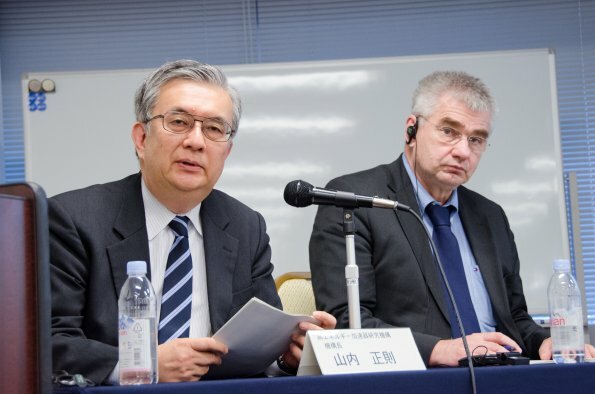 Now the Japanese government is carefully reviewing the project at the ILC Advisory Panel, and I hope positive conclusion is reached timely,” he said. This conference was not like a usual press conference to announce a new discovery, but worked well to give the journalist the idea of true international collaboration.